The ongoing story of mostly tasty (often clumsy) adventures in the kitchen. This year I've really been trying to focus on creating some holiday traditions for our little family. As a kid I loved being able to look forward to certain things we always did as a family around holidays. At Christmas I knew that Dad would make wassail in the crock-pot while we decorated the Christmas tree, Mom would be charged with adding the lights to the tree (because it drove the rest of us NUTS), we would each be able to pick out our own special ornament for the year from a local garden center and we would undoubtedly spend at least one (usually more) evening driving around checking out the local lights. Still, my favorite memory from Christmas is food-related. We always had cheese danish for breakfast Christmas morning. To this day it doesn't seem like Christmas to me unless we have danish in the morning before opening presents, that's a powerful memory tie for me! Of course there are other memories tied to Thanksgiving, Easter and other holidays throughout the year, but my parents really focused in on Christmas and made it special for me and my sisters. This year I decided to try and start establishing food-related traditions with certain holidays, that way we have a special dish to look forward to for that holiday and we only get it once a year. Christmas Eve I tried my hand at oyster stew and it was AH-MAZING. It was absolutely not the cause of my husband and I getting violently ill with a stomach flu a few days later...still, I'm a little relieved I don't have to look at a bowl of oyster stew again until this coming Christmas! Next up is Easter. I traditionally cook a ham for Easter dinner (which we're celebrating on Monday this year because of my husband's work schedule), but I wanted to add in something new this year. I settled on hot cross buns, which are traditionally made and eaten on Good Friday. Of course nothing went right...by the time Thursday evening rolled around I realized I had run out of eggs and couldn't make the buns. I still thought I could salvage it and make them on Friday, but had forgotten I was working in the office until 1pm and had to do our grocery shopping directly after that. I ended up rushing to make the buns in the evening and bursting into tears over broken frosting at about 9pm. I gave up and covered the buns, deciding to worry about the frosting the next morning. Thankfully the frosting turned out beautifully this morning, thanks to switching to my sister's standby recipe, and I was still able to serve the buns warm for breakfast...just a day late. Better late than never and next year I'll plan a little better so hopefully we can enjoy them on Good Friday. What are some of your favorite food-memory traditions? I'd love to get some ideas for the rest of the year since I'm kind of stumped holiday-wise until the fall! Whisk together the flour, sugar, yeast, cinnamon, garam masala and salt in the bowl of a stand mixer. In a separate bowl, combine the warmed cup of milk with the butter pieces, stirring until the butter is completely melted. Add the cold milk and lightly beaten egg. Stir well to combine, then add it to the dry ingredients. Mix on low speed until a sticky dough has just begun to form. Cover with a clean, dry kitchen towel and let the dough rest for at least 15 minutes. Once rested, use the dough hook on the mixer to knead the dough for about 10 minutes, until it is smooth and elastic. Keep an eye on it and add a little more milk if it seems dry or a little more flour if it seems too sticky. You want it to be smooth and ball up on the dough hook, not sticking to the bottom of the bowl at all. Transfer the ball of dough to a lightly oiled bowl, cover with plastic wrap and let it rise for 2 hours – it should be doubled. Once it has risen, lightly spray two 13x9 baking dishes with cooking spray. Divide the dough into 2.5 oz. pieces (use a scale, it makes it so much easier than eyeballing it! ), shaping each into a smooth round ball. Cover the pans with plastic wrap and let the dough rise a second time for about an hour. Combine 1 beaten egg with 1 tsp. cold water use as an egg wash to brush over each bun. Bake the buns in a 400 degree oven for 15-17 minutes. Cool completely before frosting. Beat the butter until it is light and fluffy, then add in the sugar (a few cups at a time so you don’t get showered in sugar! ), cream and vanilla. Once the sugar has been incorporated, turn the mixer up to medium-high speed and beat until the frosting is light and fluffy. You want a consistency slightly thinner than a traditional buttercream. 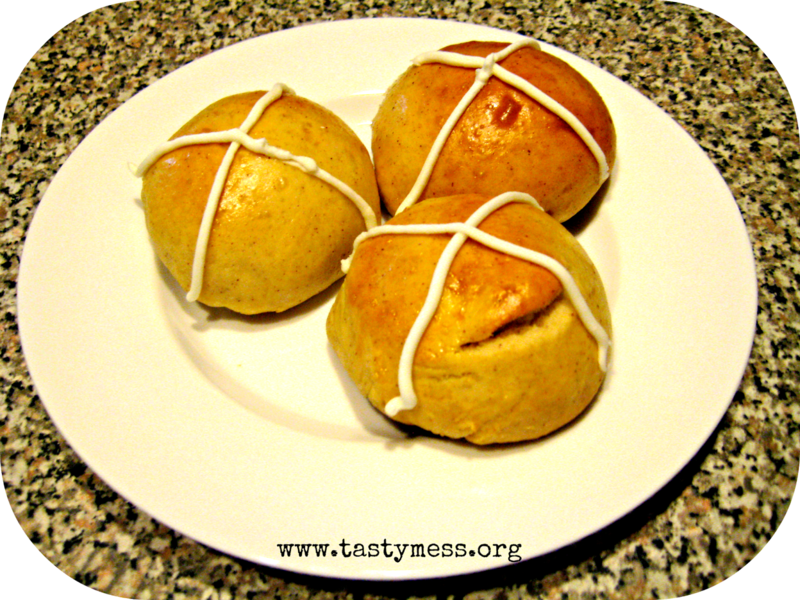 Transfer the frosting into a piping bag (or just use a knife) and draw crosses on the top of each bun. Keep in an airtight container and warm before eating. These are perfect for breakfast or a snack with coffee and tea! My name is Emily (Em to my friends) and cooking has become a passion of mine over the past 5 years. I'm excited to share my love of food with you and hope my recipes inspire you to try new ingredients, techniques and fill your kitchen with tasty messes of your own! Baked "Pasta" With A Super-Healthy Swap! A Julia Child Original: Eggplant "Pizzas"